Is federalism for progressives? Libertarians, who are generally enthusiastic about the competitive federalism model, have tried to argue that the model provides, at the very least, a kind of modus vivendi for all ideological camps, allowing citizens in each state to have roughly the kind of government that they want. Relative to a single national standard on every policy issue, everyone is better off, right? Some progressives have agreed, to a point. Is there evidence that U.S. federalism as it already exists is tilted toward progressive priorities? I believe I have found such evidence in the distribution of state policy priorities. Using the Ruger-Sorens database of state policies, which covers the years 2000-2010 (year-end), I have condensed the variance across more than 200 “top-level” policy variables (some of these are themselves composite indices) into their component dimensions using a procedure called factor analysis. 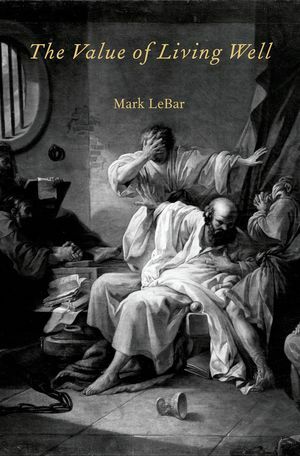 The first “dimension” thus derived represents left-right state ideology. It puts states like California, New York, New Jersey, Hawaii, Massachusetts, Maryland, and Rhode Island at one end and states like Alabama, Mississippi, Idaho, Utah, Wyoming, Texas, and North Dakota at the other. I argue that the second dimension reflects largely civil libertarianism-communitarianism, tracking a rural-urban cleavage in U.S. politics. It puts states like Alaska, Vermont, Arizona, New Hampshire, Wyoming, Maine, Washington, Oregon, and Montana at one end and states like Illinois, Hawaii, California, Maryland, New Jersey, and Alabama at the other (see figure). The overlaid normal curve shows how different the actual distribution of state policies on a left-right dimension looks from a normal distribution. This distribution looks like nothing so much as a truncated distribution. It looks as if the entire left quarter or even third of the distribution has been cut off. What could explain this? 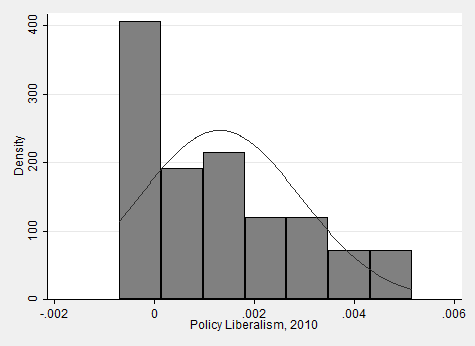 One explanation is that the distribution of state ideological preferences is non-normal. If it is just as skewed as the distribution of state policies, then we can infer that the skewed distribution is simply a result of state governments’ responding to their citizens’ preferences. I use a Partisan Voting Index (PVI) based on presidential vote share for candidates of the left in 2008 to measure public opinion ideology. 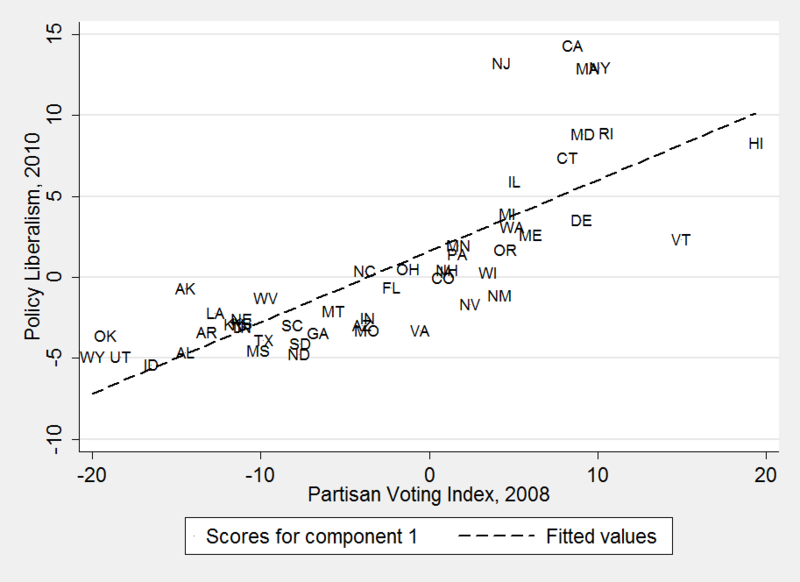 Higher values mean that a state leans more to the left of the rest of the country. It turns out that PVI is normally distributed. 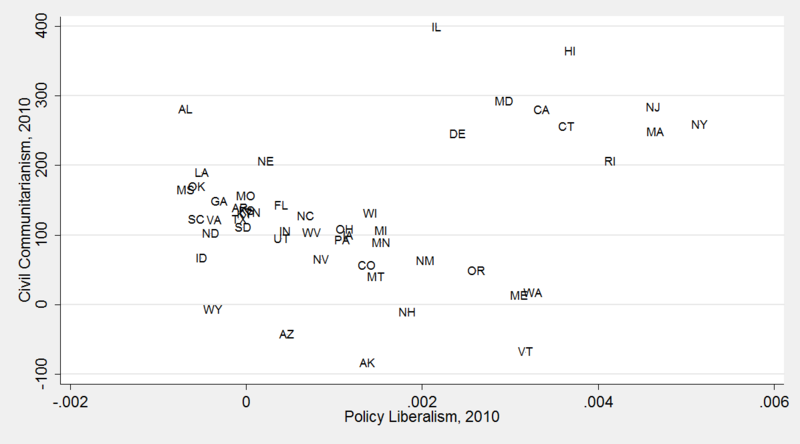 Indeed, more left-wing (respectively, right-wing) states are more likely to have left-wing (respectively, right-wing) policies. But look at the outliers! Virtually every strongly conservative state has more liberal policies than predicted, and so does virtually every liberal state. Moderate states have more conservative policies than predicted. If you only looked at states more conservative than the national average, the relationship between opinion ideology and policy ideology would look basically flat. Conservative states are apparently not giving their voters policies as conservative as they would like. Liberal states, meanwhile, are hypersensitive to public opinion, giving their citizens extremely liberal policies indeed. Liberal states face few such constraints, although gun control, campaign finance, and regulatory takings are emerging areas in which the federal judiciary has struck down a few liberal policies in the states. If that trend continues, and federal grants begin to incentivize policies liberals dislike (like No Child Left Behind? 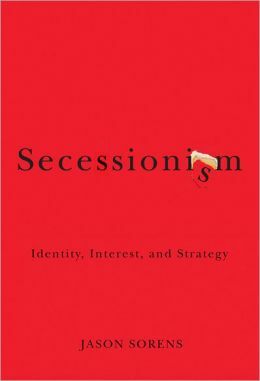 ), perhaps progressives will gain an interest in the competitive federalism model libertarians propose. But until then, it is perfectly instrumentally rational for progressives to oppose changes to the distribution of federal and state responsibilities. Status quo U.S. federalism appears to advantage progressive priorities.